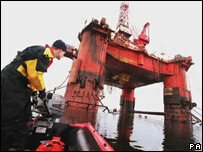 Oil giant Shell has cut its plans for North Sea exploration, blaming Chancellor Gordon Brown's tax hikes for the move. The company had planned to hire three drilling rigs, but has decided to reduce the number to two. Shell said it took the decision after a review prompted by the chancellor's decision to increase a charge on profits from 10% to 20%. The Treasury said the charge compared favourably with tax regimes abroad. However, the Scottish National Party warned that the move would cost jobs in Scotland. Leader Alex Salmond said: "The chancellor's tax grab on the North Sea was a crude attempt to hide the black hole he has created in Britain's finances, and the cost is now being felt here in Scotland. "This decision by Shell will have a knock-on effect throughout the North Sea supply chain. "It will cost jobs and threaten the viability of many oil-related businesses in Scotland." Mr Brown announced the tax rise in his pre-budget statement earlier this month. He has defended his decision to increase the supplementary charge, a move which will raise £2.3bn a year for the Treasury. The chancellor said companies could afford the rise due to projected oil prices and returns over the next few years. Shell, which has interests in about 50 oil and gas platforms in the North Sea, had planned to bring in the additional rigs to cover new exploration projects in the coming years. The company said: "We had tendered for three rigs but after an investment review following the announcement of an increase in supplementary corporation tax we have unfortunately only been able to commit to two rigs at this time. "We are disappointed by the government's recent decision and we are continuing to evaluate the impact that the proposals might have on our business." Shadow Scottish Secretary David Mundell said the chancellor had already been warned of the possible "dire consequences" of the tax move. "This news confirms our worst fears - Gordon Brown's massive tax hike is going to prove bad for Britain and bad for Scotland," said the Conservative MP. Jake Molloy of the OILC union said: "This is the only way this industry knows how to react to this type of ill-conceived tax hike and cash grab by the government. "In 2002, when this tax was first introduced, we saw the level of activity, specifically in exploration drilling, drop from 35 mobile drilling units to about a dozen. "We anticipate that type of reaction again with this 10% increase." He said pressure needed to be put on the government to reconsider the move. A Treasury spokesman said: "The decision was made against a backdrop of a structural change in the price of oil and increased profits for the oil companies. "It now reflects greater fairness for the British taxpayer on what is clearly a national resource and yet still compares favourably with other international tax regimes."